Howdy Old School Lovers! I hope you are as ready for the weekend as I am. The week has ended on a good note and I’m in a boogeying mood. This week we are shining the spotlight on some of our favorite bands. As you already know, my favorite.band.ever is Earth Wind and Fire. I have highlighted them many, many times on the site. So the next bands that came to mind were Mint Condition and The Gap Band. However as I scrolled down my top fifty songs list, my two favorite songs by the 70s/80s Ohio-based band Slave caught my eye. Once I started watching and boogeying, that’s all she wrote. Funk with this party people! Have a great weekend and check out the rest of the OSF participants! 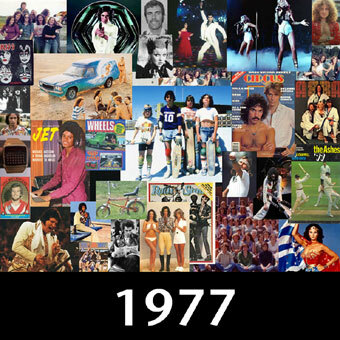 Old School Friday: 1977 Was A Damn Good Year! This weekend is going to be one of the most musically delicious of my young life. Tomorrow night, I’ll be in orgasmic heaven with your favorite crooner and mine, Maxwell. This will be my first time seeing him live and I didn’t have to sell a pint of blood to pay for my fourth row ticket! Just fortunate I guess 🙂 The show has been getting rave reviews so I’m beyond excited. Sunday, I’ll be “leaving it all behind” with Foreign Exchange, better known as Phonte (of Little Brother) and super producer Nicolay. As you know, I have been totally and completely in love with this album from the moment I pressed play. So I’m hyped to see it come alive on stage. Of course I will bring what I can to you right here so stay tuned! The theme for this week is songs from the year of your birth. As you may or may not know, 1977 was the year two of my favorite Stevie songs were released, “Sir Duke” and “I Wish”. For obvious reasons, I was so tempted to post those. However, I’m in a boogeying mood this weekend so I’m all about the disco. Man, I wish I was grown during the 70s. All that free love great shake-your-booty music! I would have LIVED at the disco. Visit the other OSF participants. I’m not fooling with HWSNBN’s (he who shall not be named) and his web sheriff! I just may take down this post tomorrow so I won’t be guilty by association. It wasn’t hard to come up with my favorite HWSNBN songs since I’ve already got them all listed here. My top two are “Adore” and “Purple Rain.” I figured they would be popular choices. As you can tell, I like nasty HWSNBN. He definitely has several spots on my babymaking practice soundtracks. When I’m not on the babymaking HWSNBN tip, these two songs always make a sister feel good. I can’t wait to see what everyone else pulls out of the vault.